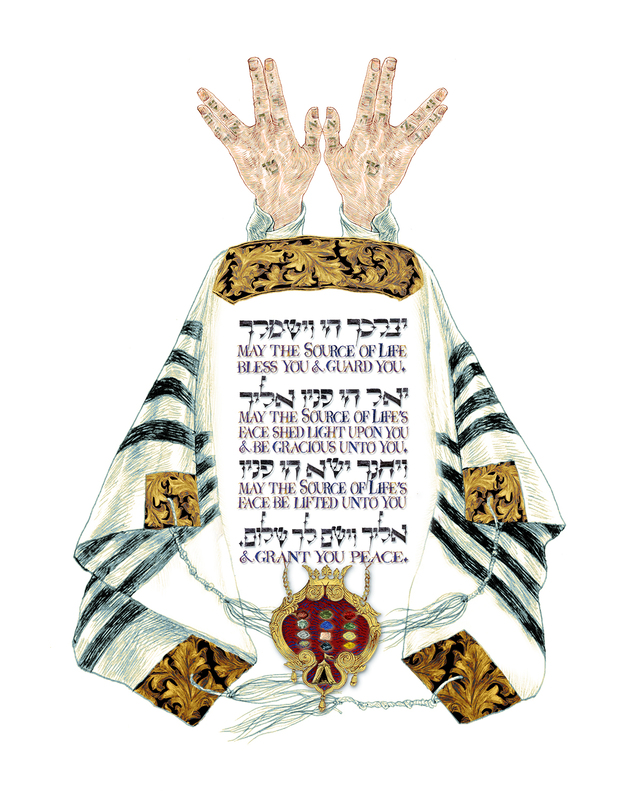 This week, I present to you The Birkat Kohanim, or the Priestly Blessing for my Kickstarter book, An Illumination Of Blessings. Fans of the Star Trek television series and its inscrutable Vulcan Mr. Spock like to reference their admiration by raising their hand in the strange configuration shown in my illustration. Since the actor, Leonard Nimoy is Jewish, it’s no small wonder that he affected this gesture from his own ethnic background, basing it on an ancient Hebrew blessing, the Birkat Kohanim, or Priestly Blessing. Inspired by the biblical verse: “They shall place My name upon the children of Israel, and I Myself shall bless them,” the verses of the Birkat Kohanim come from BaMidbar (Numbers) 6:23-27 in which the Levite Aaron, the first High Priest and his sons bless the nascent Israelites. Since then, this oldest of known biblical texts was adapted by individuals for personal use and has been found inscribed on amulets that date to the First Temple period beginning in 957 BCE, some of which are currently in the collection of the Israel Museum in Jerusalem. According to David Abudirham, a 13th century Spanish Torah scholar focusing on synagogue liturgy, although the unconventional Birkat Kohanim doesn’t begin with “Blessed Are You…”, it is, nevertheless a prayer for peace and protection. It was and is traditionally recited in a synagogue during the major festivals to express the joy and good will of these celebrations. This blessing differs from others because it is not to be recited by an individual but by one or more Kohanim, or descendants of Aaron from the priestly Tribe of Levi. Later interpretations extended its use to rabbis for blessing children at their bar or bat mitzvot and to parents who wish to bless their children before the Sabbath meal. On these occasions, it is usually introduced with a phrase requesting G-d to endow these children with the admirable qualities of Ephraim and Manasseh, the sons of Joseph or the Matriarchs Sarah, Rebecca, Rachel and Leah. The Birkat Kohanim is also replete with arcane symbols, two of which compelled me to include it in An Illumination Of Blessings. First is the unusual configuration of the hands; held spread out beneath a prayer shawl over the congregation with fingers and thumbs positioned to create five apertures. The apertures refer to the verses in the Song of Songs (2:8-9) which posit that although G-d remains hidden, He peers through the cracks in the wall, watching over and protecting Israel. Second is the idea that the Birkat contains fifteen words corresponding to the fourteen joints of the fingers and to the palms of the hands to represent the word ‘shalom’ or peace. Accordingly, I’ve taken artistic license to mark the joints of the hands with letters of the Hebrew alephbet signifying the numbers 1 to 15. Since the Birkat Kohanim speaks to us from the tribal era of Jewish history, the decorative element at the base of the blessing is my fanciful interpretation of the choshen, or breastplate worn by the high priest during Temple services. Within the elaborate golden frame are twelve precious stones, one for each of the twelve tribes of Israel. The significance of the twelve stones is explained in more detail in the AfterImages chapter of my previous book, Between Heaven & Earth: An Illuminated Torah Commentary (Pomegranate, 2009) on pages 144, 152 and 166. The choshen itself was said to contain a hidden pocket which held the Urim and Tmimim, two ‘oracular’ stones used only by the priests to determine answers to various questions brought by the people. The actual functionality of these stones is the stuff of legend. Thinking back on my own fondness for Star Trek, I realized that Spock’s ubiquitous salute introduced me to a facet of Judaism that would infuse my artwork with mystical speculation for the rest of my creative life. And that turns out to be an inadvertent blessing, indeed.